Commercial property owners surrounding the world’s busiest airport are combining resources to increase safety and prevent criminal activity. Leaders of the Airport West Community Improvement District (AWCID) and area law enforcement agencies today outlined a community-focused initiative to enhance security. 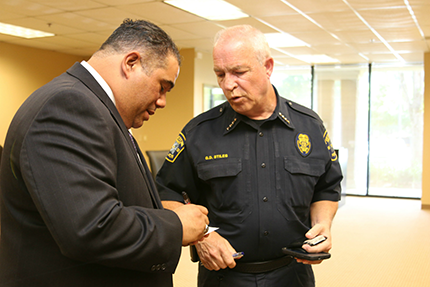 Jon Antoine, AWCID Public Safety Director, said the new plans will generate specific enforcement and targeted approaches to overcoming challenges facing area employers as well as their employees and clientele. All AWCID public safety efforts will operate in coordination with the respective law enforcement agencies serving Fulton County and the Cities of Atlanta, College Park and East Point. "This new collaborative effort is all about positive growth. It's about all of us being partners in order to maintain great public safety for the community," said Major T. Mabry of the East Point Police Department.